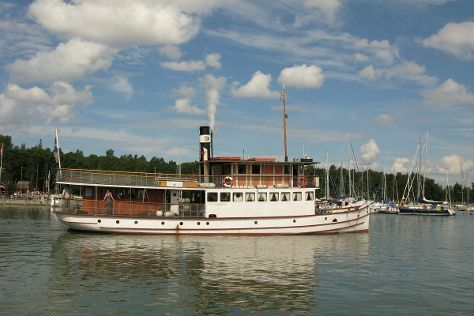 On the 26th (Fri), explore the historical opulence of Turku Castle and then trek along The Archipelago Trail. To see maps, photos, other places to visit, and other tourist information, read our Turku tour builder site . The Route module shows you travel options from your home to Turku. In April, daily temperatures in Turku can reach 9°C, while at night they dip to -1°C. Finish your sightseeing early on the 27th (Sat) to allow enough time to travel to Nagu. Start off your visit on the 27th (Sat): brush up on your military savvy at Maritime Exhibition Sjofartshuset and then pause for some serene contemplation at Nagu Church. To see reviews, other places to visit, where to stay, and more tourist information, you can read our Nagu attractions website . Drive from Turku to Nagu in 1.5 hours. April in Nagu sees daily highs of 9°C and lows of -1°C at night. Wrap up your sightseeing by early afternoon on the 27th (Sat) to allow time for travel to Uusikaupunki. Kick off your visit on the 28th (Sun): see the interesting displays at Automobile Museum, examine the collection at Bonk Museum, and then take in the architecture and atmosphere at Uusikaupunki Old Church. To see maps, other places to visit, reviews, and tourist information, read Uusikaupunki online trip itinerary planner . Getting from Nagu to Uusikaupunki by car takes about 2.5 hours. In April, daytime highs in Uusikaupunki are 9°C, while nighttime lows are -1°C. Finish up your sightseeing early on the 28th (Sun) so you can travel to Helsinki. On the 29th (Mon), admire the landmark architecture of Rock Church, take an in-depth tour of Seurasaari Island and Open-Air Museum, then step into the grandiose world of Sea Fortress Suomenlinna, and finally explore the world behind art at Kansallisgalleria. Get ready for a full day of sightseeing on the 30th (Tue): admire the natural beauty at Observatory Hill Park, don't miss a visit to Senate Square, then browse the eclectic array of goods at Hakaniemi Market, then test your team's savvy at popular escape rooms, and finally take in the architecture and atmosphere at Helsinki Cathedral. To see where to stay, reviews, traveler tips, and other tourist information, refer to the Helsinki day trip planning tool . You can drive from Uusikaupunki to Helsinki in 3 hours. In April, daytime highs in Helsinki are 9°C, while nighttime lows are 0°C. Finish your sightseeing early on the 30th (Tue) so you can drive to Porvoo. On the 1st (Wed), contemplate the long history of The Runeberg Home, get some fabulous bargains at Brunberg Candy Factory Shop, steep yourself in history at Ungern and Rosen Fortresses, then pause for some serene contemplation at Pyhtaa Church of Saint Henry, and finally make a trip to Porvoo Old Town. On the 2nd (Thu), you'll have a packed day of sightseeing: stop by Riimikko, contemplate in the serene atmosphere at Cathedral of Porvoo, and then take in the dramatic natural features at Hiidenkirnut. To find ratings, where to stay, maps, and other tourist information, go to the Porvoo trip builder app . Traveling by car from Helsinki to Porvoo takes an hour. Alternatively, you can take a bus. In April in Porvoo, expect temperatures between 9°C during the day and 0°C at night. Finish up your sightseeing early on the 2nd (Thu) so you can go by car back home.